(Lisa Rathke | The Associated Press) This Tuesday, March 29, 2016, photo shows a farm in Sharon, Vt. The farm was bought by the NewVistas Foundation of Utah, which was planning a large-scale development based on the writings of Mormonism founder Joseph Smith, who was born in Sharon. The foundation bought about 900 acres in four towns near Smith's birthplace. 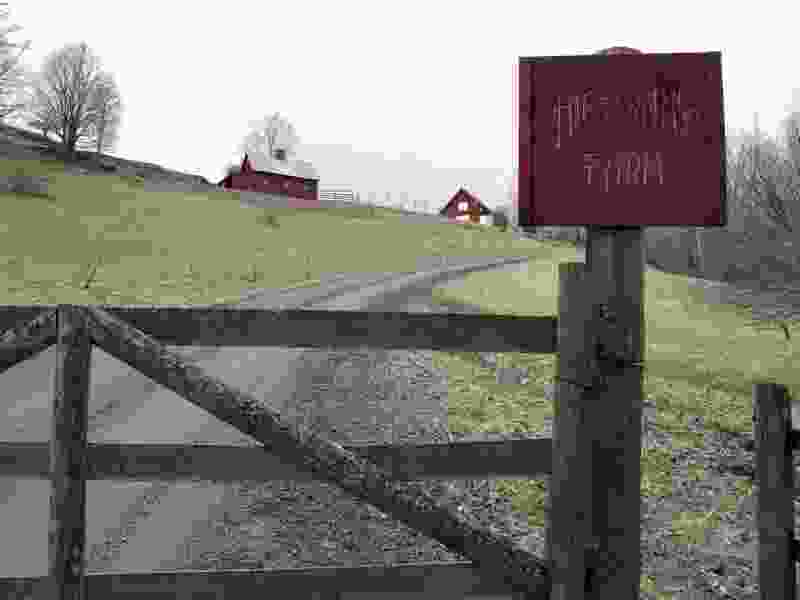 Tunbridge, Vt. • A Utah businessman is abandoning plans for a massive development in four rural Vermont towns based on the papers of Mormon founder Joseph Smith after fierce opposition to the project. David Hall’s family foundation NewVistas had been buying land near Smith’s birthplace in Sharon, Vt., for what he described as an economically, ecologically and socially sustainable development with housing for 20,000 people many years in the future. A local group was formed to fight the plans. The towns and the Legislature also voted against the project, which didn’t dissuade Hall at the time. On Tuesday, the National Trust for Historic Preservation announced it had put the towns — Royalton, Sharon, Strafford and Tunbridge — on “watch status” because of the proposal. Hall had expected locals to be opposed the plans at first but hoped they would grow more accustomed to the idea as other projects are built. Many residents in the rural, mountainous region with a population of about 6,600 believed such a large-scale development would change the character of their small communities, tax resources and limit access to recreational areas and mountain views. The Mormon church had also denounced his plans in Vermont and for another community in Utah. Hall said he is focused on doing test buildings and test villages in an industrial park in Provo, Utah. “An actual community is way off still,” he said. In Vermont, he wants to sell the 1,500 acres he’s purchased in the four towns. “Hopefully, I can find an investment group that will take it on and adopt the local plan instead of my dream,” he said. Michael Sacca, head of the group formed to fight the project, the nonprofit Alliance for Vermont Communities, said he’s very pleased with the outcome. “This has been an amazing amount of effort by a lot of people,” he said. “We will continue observing the area in the coming weeks and months, and we hope the future of these land parcels is in keeping with the historic character, community interests, and conservation spirit of these towns and Vermont as a whole,” said Stephanie Meeks, president and CEO.